﻿ The Ampersand Hotel, London | FROM $214 - SAVE ON AGODA! "The staff is friendly, helpful and professional." Have a question for The Ampersand Hotel? "Staying again on my way back home looking forward to it"
"the hotel is lovely, service is amazing, the lounge in the lobby is a delightful place to retreat to." "Very good and strategic location." "Great restaurant, we will be staying again for sure." Inspired by the great Victorian values of discovery and wonder, this 111-room luxury boutique hotel, bar, restaurant, and drawing room deliver a cosmopolitan of warmth, humor, and total comfort with a modern, whimsical twist. The Ampersand Hotel combines contemporary excellence in design, service, food, and technology in an 1888 building at the capital's heart. Visitors may enjoy artisanal blends of the finest coffees put together by Ampersand baristas. The Ampersand Hotel is facilitated with the latest Technogym equipment which is available 24 hours a day to hotel guests. This includes a treadmill, bike, free weights, and cross trainer. 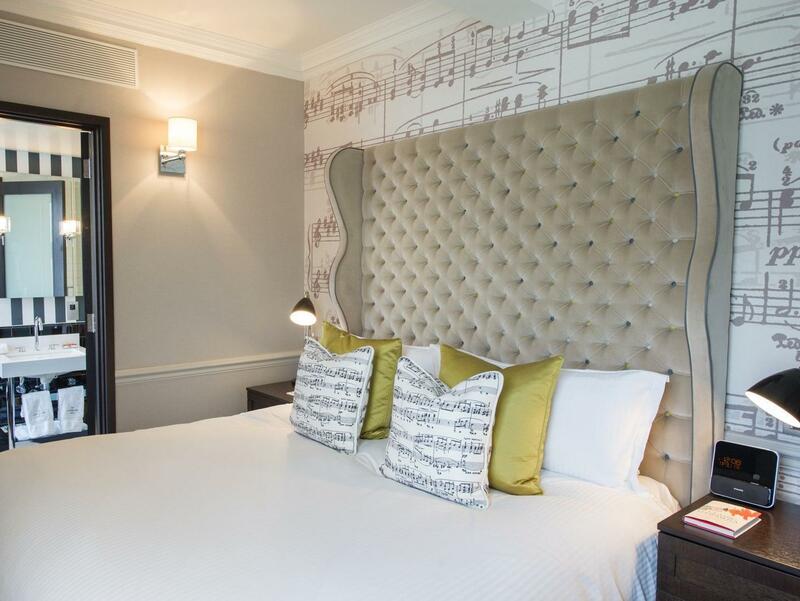 The Ampersand Hotel encourages all travelers to experience the hotel as a luxury hotel near Hyde Park and Kensington Gardens. "Excellent service prior, during and after our stay." Please note that children up to 2 years stay free in parents room, using existing bedding. Extra beds are available at a charge please contact the hotel directly to arrange for one. Amazing location, staff could be much more attentive (when i arrived, i carried my bags up the stairs, opened the doors and went to the reception by myself! ), housekeeping staff were pleasant enough but did not change my sheets daily like i asked, and did not stock up my room with amenities consistently (one day you get biscuits and orange juice, the next day you dont and have to ask for it. Had to ask for toothbrush too). For the price, you'd expect a little more overall. But clean, cosy room, and great location! Great location among all the museums and right next to the Tube for getting around London pretty easily. We got the room that was one-up from the entry-level room and it was lovely, a lot lot bigger and more spacious than my brother who booked the entry-level room. Worth that extra little money. There is a great cafe from breakfast and lunch just across the road adjacent to the Tube. The whole design of the building is very cool and felt super modern for being in such an old building. 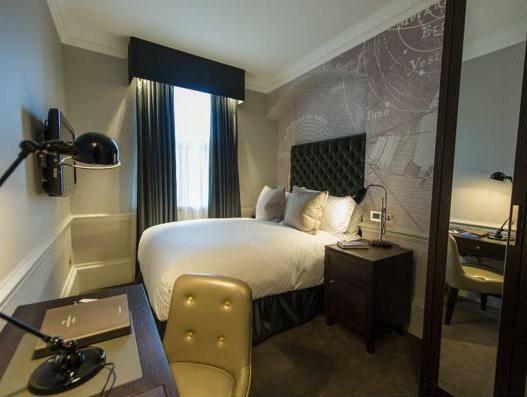 The Ampersand has everything you need for your stay in London. It is seriously just across the street from the South Kensington tube station. In an upscale neighborhood close to restaurants, coffee shops and small markets... everything you need within walking distance. The staff is friendly, helpful and professional. We arrived early and our rooms wasn't quite ready, so they took our luggage for us and it was waiting in our room after we returned from sight seeing. Excellent service prior, during and after our stay. Very good and strategic location. Very convenient. We stayed in the Deluxe room and the room size is good, especially for London. Love the floor heating bathroom and the handy phone. Will return and highly recommended. I have high standards and I have to say this hotel surpassed them. Fantastic rooms, immaculate, great service, gorgeous design. The location is also perfect. I would not change a single thing, looking forward to my next visit. This hotel is beautiful, modern and comfortable. The location can't be beat. It is close to attractions such as the V & A museum and the very central tube station South Ken. We had a wonderful room full of mod cons and it was quiet. But best of all, you can walk outside and find lots of restaurants and food options. The lovely surrounding streets make it good for walking and enjoying London on foot. I would definitely stay here again on my next visit!!! The staff are super friendly, the hotel is clean and well maintained, looks just as good as it did 3 years ago, the restaurant is superb and it is a block from the South Kensington tube station. Will stay here again. I've never seen a hotel room this small before. This hotel would've been perfect, 5 stars, if not for the tiny room. It was just me and my daughter, and we're not big people. We're both skinny 100lb people and we felt squeezed in there. For the price we paid, we expected more, and yes, I know we're in South Kensington. It still didn't justify a hotel room of this size. I heard other guests talk to front desk about the size of their rooms, and I guess they've been taught to spin their answer..."you booked a standard classic room category...if you wanted a different room, you should have booked the next category, the deluxe..." Well, you're looking at more $$$$$$ if you did that when you've already paid $$$$. So don't bother discussing it cos it's a conversation that'll go nowhere. Other than that, the hotel is lovely, service is amazing, the lounge in the lobby is a delightful place to retreat to. The South Kensington tube station is literally a 3-min walk away. The restaurant options are plentiful. The V&A museum, Natural History museum, and Science museum are a short walk away. I'd stay at the Ampersand again. I'd also recommend this hotel but only if you really love your travel companion cos you'll be really cosy in that room. I had a very nice stay at the Ampersand. I was only in London for one night, following a stay at another London hotel the week before, then a visit to Scotland. I almost wish I had stayed at the Ampersand for both London legs of my trip (the only thing that edged it out was the other hotel had a whirlpool bath, which was great after long days of sight-seeing). The hotel is in a fantastic location, right across from the South Kensington tube stop, near some great attractions (The Victoria & Albert is one of my favorite museums), and lots of fabulous shopping ad eating. The decor was truly lovely, the bed was DIVINE, and the staff were friendly and helpful. The complimentary minibar was a nice touch, and the thematic design was brilliantly done. I was a little worried I would run into some London snobbery, as the place looks quite posh, but the staff I encountered were wonderful. I ordered room service, and the food was excellent - I wish I'd had time to try the afternoon tea. I will definitely consider staying at the Ampersand again! We were really happy with our stay. The staff was friendly and responsive. The rooms have unexpected touches, like French press coffee makers and a complimentary mini-bar. The hotel has an intimate feeling, just the right size. The location is great, very close to the South Kensington tube station, many bus routes and with a taxi stand right out front. It was perfect for us. It was indeed a very pleasant stay as the staff were really friendly and helpful, the location is great with most of everything I need around it. The 24-hour room service is perfect for someone like me who stay out late and need something to munch on when I get back the hotel late. Love to be there again! The hotel is beautiful, with a games room, library and food available 24 hours a day. Staff were welcoming, friendly and helpful. Room had lovely toiletries and complimentary soft drinks in minibar. We stayed on New Years Eve. The staff were friendly and very good with children. They helped with directions to where we needed to go and even provided us with a map. The room was beautiful, clean and decorated to a high standard. The bed was very comfortable. I haven't slept so well in years! The room was well equipped with complimentary soft drinks in the minibar; not just tea and coffee like most hotels. Lovely toiletries were provided and i had a gorgeous shower. My daughter made good use of the smart tv; playing youtube videos, accessing Facebook and playing music from the hotel playlists. We enjoyed playing table tennis and board games in the games room. And with food being available 24 hours a day we were able to sit in the drawing room and have something to eat and a glass of wine quite late in the evening. Breakfast, in the restaurant on the lower ground floor, was divine. All the regular foods you'd expect on the menu plus many more. My daughter had homemade waffles with Nutella, maple syrup and banana's, while I had coconut porridge with caramelised banana's. Delicious! The service was friendly and we didn't wait long for our food. I would recommend this hotel to anyone. It is only a short walk away from the Natural History and Science museums and the Diana memorial in Hyde park. We will definitely be back. Couldn't fault any part of our stay. Thank you. Great stay! I'll definitely be back. 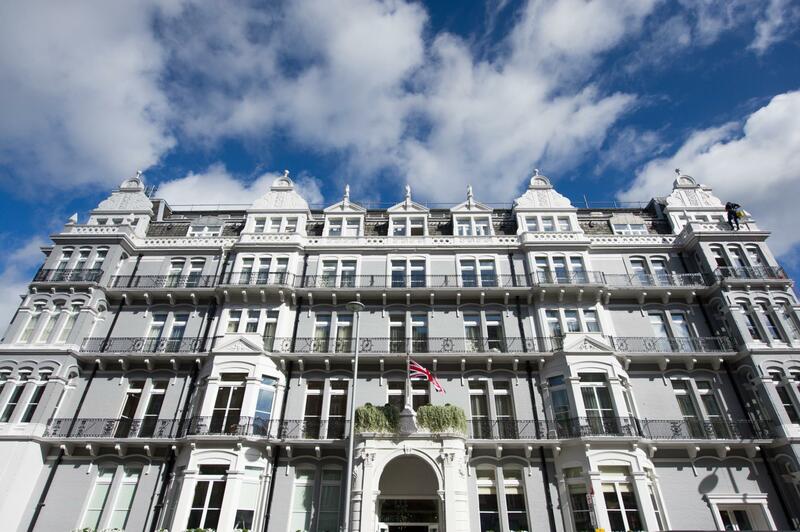 Love the location - just across the road from the South Kensington station and a short walk from Harrod's, Harvey Nichols and other great shopping. Lots of amazing restaurants in the area as well. The hotel itself is stylish and the staff were very helpful. The hotel situated in a very convenient place. Many tasty and stylish restaurants around. It is also surprised that the design of the hotel room is really great. It gives a extremely comfortable environment for guest to have a relaxing time. 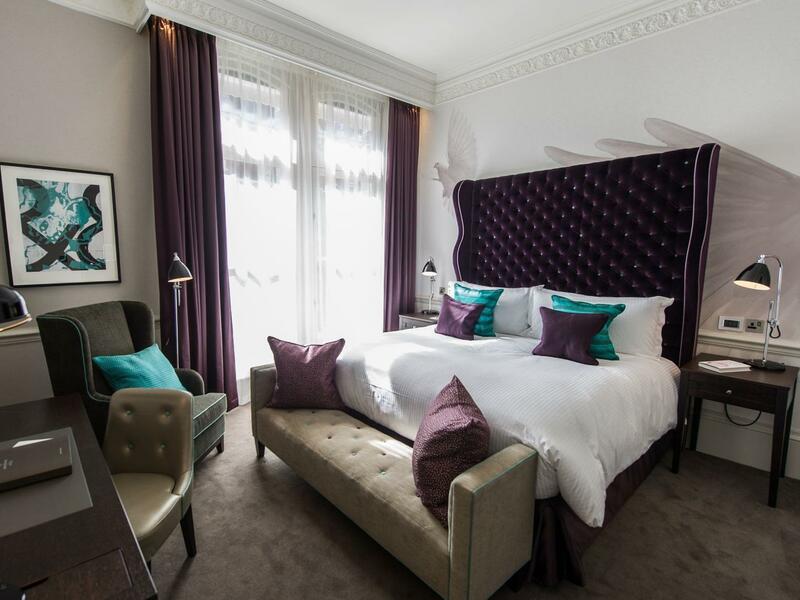 The location was probably the best thing about staying at The Ampersand Hotel, it was just 2 mins from the Tube Station, walking distance to Harrods, Harvey Nichols and Sloane Street. Great restaurants in the area. In addition, the hotel is well maintained, with a modern design, esthetically pleasing to the eye. The staff was also very friendly and helpful. very nice hotel, new since summer 2012 so everything looks new. great location near the tube direct line to the touristic center of london. great breakfast & lunch places around the hotel. the rooms are a bit small but if you can live with that there is nothing wrong to say about this hotel. Clean room. Attention to comfort of guests including little conveniences such as complimentary water and soft drinks in mini bar, bath robes, power adapter for foreign travelers, and free wifi. The location near the South Kensington tube station is extremely convenient for central London. The small details add to ease and comfort of visit. Staff is very friendly and eager to assist in solving any issues. This is my new favorite London hotel.